just a pieace of trash tool…. The technical reason for this limitation is odd (at the very least..) and the impact on the user experience is far from being negligible. Microsoft should consider fixing it. Why are any databases of concern here, if it is an IM message, it should just have be sent straight from the sender to the recipient; why is a database involved in this process? NVARCHAR datatype has a limit in storage. The field can’t contain more then 8000 characters. That’s why you can’t send it. Thanks for sharing. 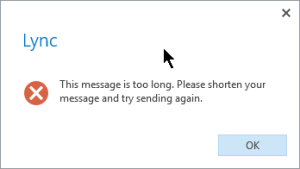 Regardless the technical reasoning for the limitation, it is still a frustrating user experience for those of us coming from instant messaging platforms that do not have such a limitation. nvarchar(max) should contains 2GB of data.